Where does your cat go at night when it heads out through the cat-flap or out of the window? The latter is what is what Zoe thinks when she sees her beloved black cat go out every night. 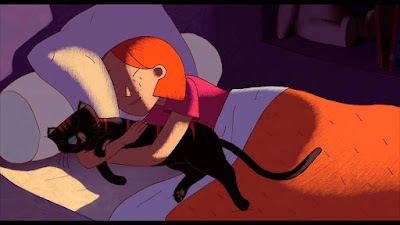 She gets presents brought to her and her cat is always there snuggling up to her in the morning, but what happens on the streets of Paris for her cat? It becomes all the more intriguing when Zoe is brought a shiny silver bracelet as a present. That night she follows her cat and has a night that will change her life, and that of her mother, forever. 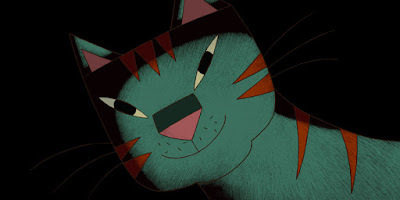 A Cat in Paris or Une Vie de Chat is a French adventure-crime story written and directed by Alain Gagnol and Jean-Loup Feliciloi (who only directed). 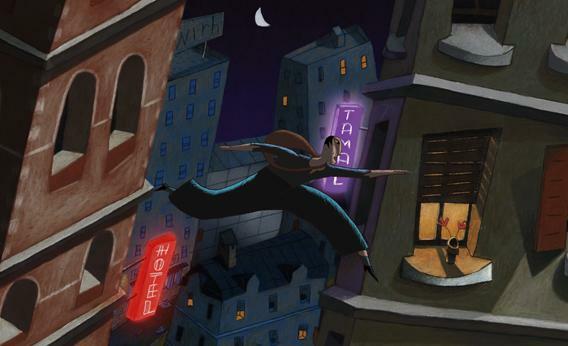 It was released in 2010 when it was nominated for an Academy Award for Best Animated Feature. This happened to be the same year that Chico and Rita was also nominated. It was finally released in the UK in 2012. The story of A Cat in Paris is as simple as the opening paragraph. It really is about how Zoe one night follows her cat through her bedroom window and the events that unfurl. The film opens with a wonderful fluid sequence where a cat-burglar (later introduced as Nico) is conducting a late-night raid on a jewellers assisted by a black cat. This cat whose name we never find out snuggles up to Zoe in the morning so she is none the wiser of his dubious late-night activities. Zoe lives with her mother, Jeanne, and their relationship is fraught. Zoe’s father was a policeman and was killed in the line of duty. Her mother, also working for the police, works very hard and is determined to catch the man who killed her husband, a criminal called Victor Costa. The fact that Jeanne works so hard puts a strain on the relationship between her and Zoe. It appears that Zoe has a better relationship with Claudine, her nanny. Jeanne’s current case is to protect a valuable piece of art and capture Victor Costa should he try to steal it. As an adult you can appreciate why she might be distracted and working so hard. Feeling a bit neglected, Zoe heads out after the cat on a night where her mother has to work. In doing so she overhears Victor Costa and his plan to steal this great piece of art, the Collossus. She is nearly caught and runs into a house owned by Nico who rescues her. What follows includes chases across roof-tops, a trip through a zoo, night-vision goggles, gargoyles, Notre Dame and a big crane. I like the look of Paris and the characters, but there is something ... odd with perspective when applied to the building and man-made objects. It’s not just one item where everything else looks right, it’s everything. This sounds like it should be horrible to look at but I assure you it’s not, it’s a deliberate style-based choice. It gives me the feeling of a hand-drawn animation much like the quick and simple newspaper cartoons. It also gives a strange sense of energy and chaos in the world above the street level that people rarely look up at. As the majority of the film plays out way above street level this sense of chaos brings a sense of tension to the proceedings. There is something about the look of the rooftops and city view. It does look and feel like Paris. This is helped by them including familiar landmarks but in addition, it has a very continental design. The architecture is a bit older, large windows, built-up areas full of flats. Where people live in this production could not be mistaken for London. The look of the human characters is simple but very effective. It has a very child-like quality. There is a family resemblance between Zoe and her mother, even down to the freckles. You could easily see her growing up to look “just like her mother”. The faces have very minimal detail with oval eyes, nose mouth and perhaps one other feature to distinguish them. This gives a nice consistency to them all and it evokes images of the picture-books I looked through when I was much younger. I love the cat. He is such a fun character to look at and fits in with that children picture-book style of the human characters. His face follows the same design choices and it is fun to see how they have given him some human behaviour traits. Something I was less keen on was the kind of dynamic shadow or shading the characters displayed. Unless you’re moving or the illumination source is, the shadow should be fixed, not flickering. It was as if the scene had been lit by a failing fluorescent tube light, of the power the light bulb was not quite enough to maintain a constant brightness. Again it was a stylistic choice but it took quite a lot to ignore it at the beginning of the film. The story and the animation kept my attention away from seeing it eventually. Aside from the strange shading effect the colouring is lovely. The colours are a bit muted and you could imagine the drawings have been skilfully shaded using coloured pencils. I keep coming back to the picture-book but it really has that feel and look. It is a child’s picture-book come to life. There is a wonderful fluidity of movement in this film. Whilst it does defy physics (and in some cases anatomy!) it never feels ridiculous or out of place. This is particularly in evidence when Nico is out at night committing burglary and when people are running across the rooftops of Paris, and swinging from signs. As he slinks past windows he contorts part of his body into crazy shapes (for example his arms become wavy lines). The look and designs of the characters also help, the curves and continuous lines create an additional sense of grace. As body joints do not appear as harsh angles or lines. Movement fits the characters personalities too. Costa the villain has his own way of moving with menace, his bungling gang have a comical feel to their movement. Zoe moves like a child and her mother moves depending on how she feels. When confident there is purpose and when under threat there is a delay and it feels like she hesitates. Our cat moves like a cat. He has an effortless, fluid cat-like swagger as he goes on the prowl at night. There is also the feeling of a delay in when he moves. It’s like there is a split second thought before he decides to do something, a sense of deliberate, thoughtful action, even when sticking out his tongue. His behaviours reminds me very much of cats who are content in their homes and who crave attention. He does what he wants, when he wants and his human associates will do as he wishes. I have certainly had a cat walk up to me and force their way under my arm, though thankfully not when I was asleep. I have also been around cats who demand the door is opened for them when there is a perfectly serviceable cat-flap. A Cat in Paris is a very simple crime caper on the surface with a family relationship at its core. Nico takes on the role of the protective father whilst Zoe’s mother Jeanne is the protective but conflicted single parent. It’s difficult to write about some of the story elements without giving the story away. Like all good stories for children there is a sense of danger and peril for the subject (like in a good fairy tale), heroes, villains and bumbling side-kicks. A Cat in Paris is a very enjoyable to watch and depending on the age and maturity of children in a family, can be enjoyed by all. 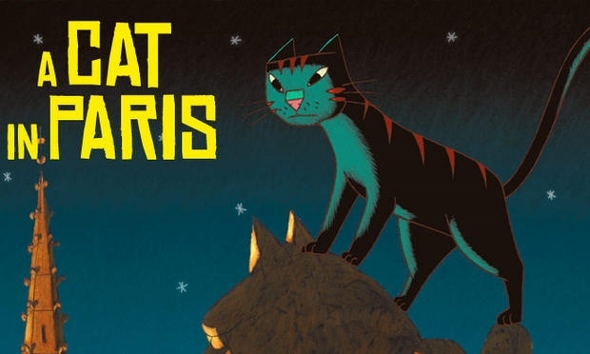 It does have some nice design work, the cat is great and the story is decent. It is a solid piece of entertainment but is not exceptional sadly. If it is “on” or easy to watch then give it a go, but I would not go out of your way to find a copy. 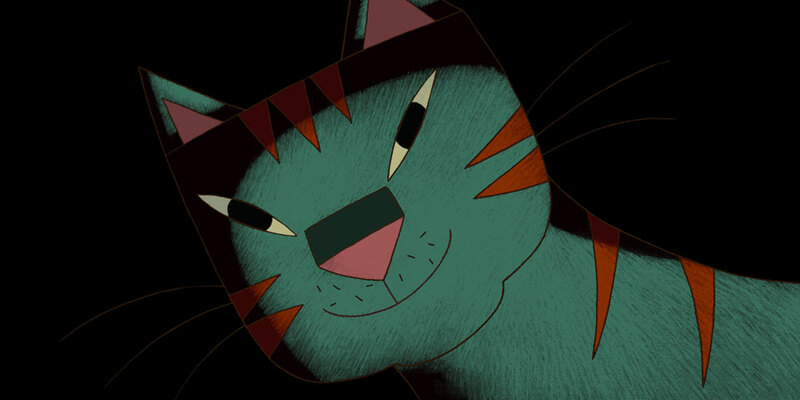 A Cat in Paris is available on DVD from SODA in the UK or DVD from GKids in the USA. It is available for streaming in both territories.